Our beautifully decorated 2000 square foot tasting room is an ideal setting for both formal and informal events. Corporate luncheons, meetings, workshops, classes, bridal showers, baby showers, rehearsal dinners – let us create a unique event for you. Our outdoor area includes a covered porch, wooded walking trails, large cedar wedding arbor and a 1 acre field landscaped based on sacred geometry. Have your conferences at Seven Doors Winery. 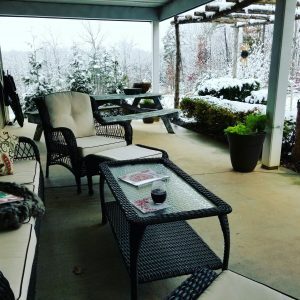 We have created a relaxing space within a 1 hour drive from Roanoke, Lynchburg or Smith Mountain Lake that is perfect for retreats, classes, workshops, corporate meetings, team outings, baby showers, bridal luncheons and engagement parties. Whether it is our zen tasting room, our large covered porch, or sunny two tiered deck – there is plenty of space indoors or outdoors to mix and mingle comfortably. Contact us to help with ideas and planning to make this a memorable event.